As I sit and write, I hear the wonderful pitter patter of rain in the garden. The smell outside is delicious and strangely familiar too after such a long absence. Hopefully there’ll be more rain later on today as the garden is completely parched. It’s a delightful distraction, but on with the blog now. 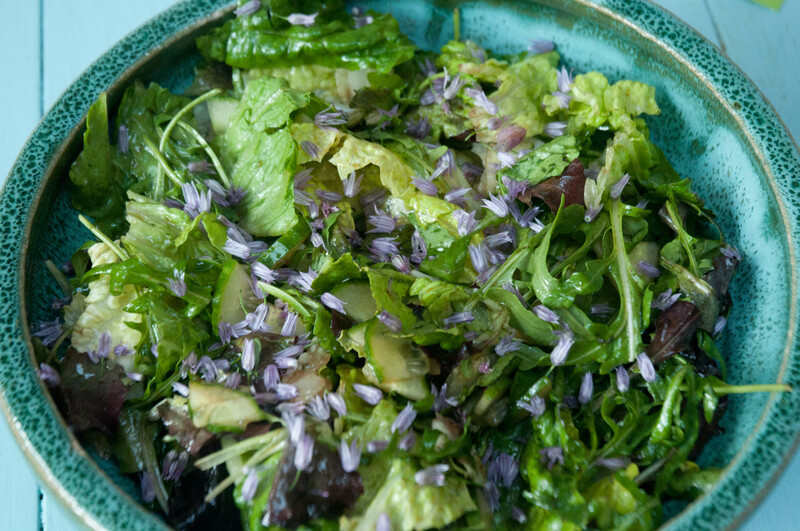 I often add chives to a salad, but a friend suggested using the flowers too. They also supply a gentle chive flavour and make the salad much more decorative when there aren’t many other flowers to enliven a dish at the moment, (although my self-sown Nigella look like they may be in bloom any second now). Any other edible flower suggestions from your gardens/allotments ? I’m a big fan of nasturtiums. The flavour’s a bit strong for me, actually, but my husband loves it, and they look so great in the garden and in salads! 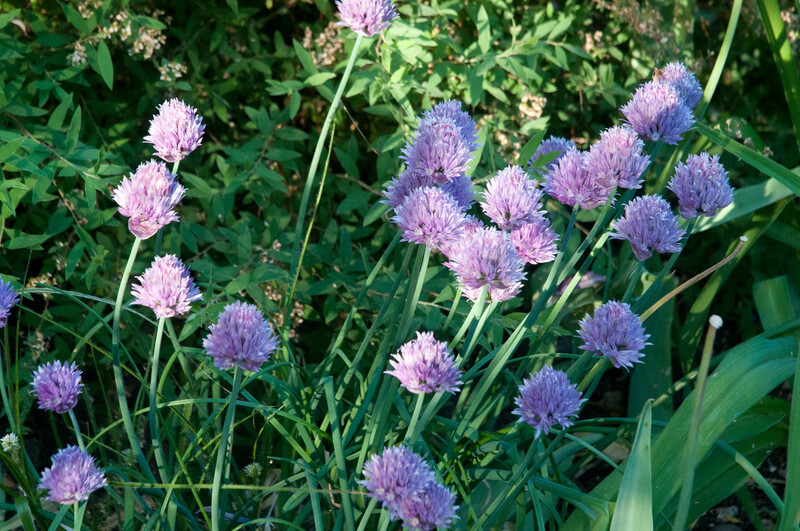 Thank you for your suggestion about chive flowers – look forward to using them. I would never have known. Naomi and Nome-a troika (or triumvirate?) of Naomi’s in fact! Don’t get too many of those these days! Looking forward to nastutriums too as I do love their peppery taste, but it will be a while yet. Just read that all types of Campanula flowers are edible too, and have plenty of these to experiment with. Might go and have a taste right now. Rozelle-anything in flower at the allotment at the moment? I was browsing Jekka McVicar’s herb website yesterday and learned that the flowers of dianthus (carnations) are edible. Lavender flowers can be added to cakes, violas are nice in salads, courgette flowers can be stuffed and deep fried and most of the herb flowers can be eaten (borage, mint, thyme, etc). Mark Diacono wrote about an edible fuschia last summer which caused a little frisson in our (fuschia-hating) community! Oh, and don’t forget calendula for brightening up a salad! Sounds like we can have lunch in the garden without bothering to get in the kitchen first! I’ve tried drying rose petals to eat as crisps. Not that brilliant though! There are lots of wild flowers around including the white ransoms (wild garlic), and also the leaves and flowers of jack-by-the-hedge, although they are a bit bitter (and garlicky). And elderflowers are out now. I wonder if people who have elders in their garden and don’t use them could let others cut a few because the juice is so good – even just left in a glass of water for 15 mins or so (overnight for a stronger flavour). I’ve not tried chive flowers but mine are flowering too, so I’ll give it a go. I’m a nasturtium person – just a few – but apparently I used to eat buttercups. Not recommended, but I was about five. Judging from the tastes of the wildlife that frequent my garden, there is much to enjoy with most any flower!